Anything can be dried if it is done slowly and evenly enough. To dry faster optimize the body recipe, ware cross section, drying process and develop a good test to rate drying performance. I admit it again. I blissfully ignore countless warnings and suffer endless problems. Eventually, however, I get the point. When it comes to drying ceramics, my learning has been true to form. I have an uncanny capacity to break the rules and get away with it, then act surprised when problems strike! I heard an appropriate quotation that applies well: "I have failed before. And I can do it again!". Anyway, I have compiled a few points about drying. They might seem simple, but that doesn't seem to stop a lot of others from tripping over the snags the way I have. Ware shrinks when it dries. In most cases cracks happen when the shrinkage occurs unevenly enough within a piece to overcome its inherent strength to resist. So, it is not the speed of drying, but the unevenness of drying that results in ware either cracking or harboring residual stresses. The influence of evenness of drying is well demonstrated by considering that one studio or plant may dry ware in a uniform manner without failure in half the time another is doing it with high losses. 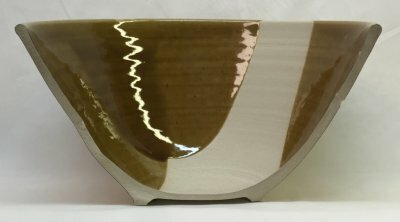 If you are a small production company or potter you may think that you can dry functional ware, for example, out in the open if you turn and rotate it often enough. Unless you live in a damp swamp and use a non plastic clay, I seriously doubt you will get away with this for long. Unless you have a robot you simply cannot turn it often enough to keep the drying even. For complicated shapes certain sections will dry before others no matter how you orient it. For smaller production, why not simply cover the ware well in cloth (use a fabric that drapes well and does not let air blow through it). How can you get more uniform drying? Consider these suggestions. Isolate the stage in the process where variations in water content within a piece (drying gradients) are first introduced (i.e. an early unshielded draft, ware left out too long). Plastic clay easily absorbs stresses created by a 3% spread in water content between the driest and wettest sections of a piece. Once introduced, however, this spread tends to remain throughout the rest of the drying process. In later stages, it can put great stress on the stiffening piece, inviting weaker sections to seek relief. The "nirvana" of drying is a humidity controlled batch or continuous drying chamber. Surface water is removed from ware by a hurricane of damp air in an atmosphere of slowly declining humidity. Unlike a gentle breeze of dry air that only reaches more exposed sections and dries them first, a brisk humid draft is more likely to reach all of the surfaces and sides (including the recessed nooks and crannies). It removes the same amount of water but does it evenly. If you lack such a facility, a special plastic-enclosed area of the studio or plant (a humidity chamber) where racks of ware can be stored is excellent (humidity is a natural consequence of enclosing the wet ware). For small scale operations drying ware slower under cloth and plastic is another option. 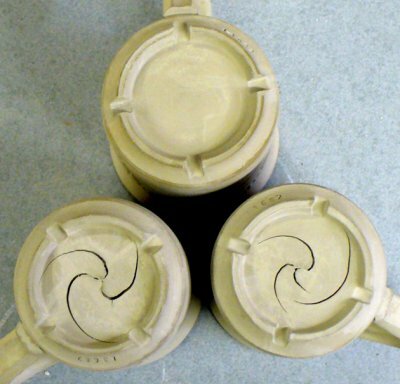 In the final analysis, any ceramic item made using reasonable construction techniques can be dried given the necessary time to make the process even enough. Give consideration to each type of piece being dried, think of its special drying needs. Potters and sculptors, for example, must do this all the time. In complex or unusual shapes, slow drying sections can be accelerated by a different orientation (e.g. turning bowls over as soon as possible), placement (e.g. 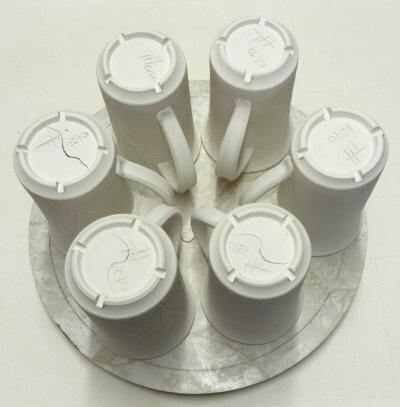 putting mugs in circles with handles at the center), or air flow adjustment or shielding (e.g. slowing fast drying portions by special covering or application of wax resist or latex which is burned off in firing). Ware needs adequate air flow, temperature, and time to give up remaining pore water that is not released at room temperature (or water introduced during raw glazing). In the absence of a +100°C drying chamber, your kiln is the final stage batch drier. If you are using an electric kiln, for example, that lacks air flow to carry away surface water, then consider that a kiln venting system is not only an investment in safety, but in proper drying. Vent or no vent, it is vital to provide a slow heat up around boiling point to give opportunity for all pore water to escape before firing proceeds. If not, ware will either explode or fail at sites of residual drying stress. If necessary leave the kiln on low overnight before beginning the firing in the morning. What if you do have a drier? Many reach temperatures far below 100°C (130°F in one case we are aware of), so ware coming out of them is also not completely dry. Although it might seem that temperatures higher than 100°C would create steam that could fracture ware, this is not the case. Most ware can easily withstand 140°C. Highly grogged clays of low plasticity have superior drying properties not only because of the obvious lower drying shrinkage, but because permeability is much improved and water is more easily able to channel to the surface without obstruction. Efforts to even out the drying process are therefore much more fruitful with lower plasticity bodies. Grogged clays not only vent water better by providing a network of interconnecting pores, but the grog particles act to terminate cracks in their early microscopic stage. Drying can be a batch process or a continuous one. If you need fast production drying and you must do it as a batch process then you need a chamber with equipment that can control the temperature and humidity on the inside so that the ware goes through a cycle starting with high humidity cool air and ending with high temperature dry air. High velocity flow is needed throughout the cycle so that all surfaces are visited by moving air. The airflow should be constant with the humidity and temperature changing as the cycle proceeds. Humidity control can be as simple as controlling how much outside dry air is allowed in and damp re-circulating air is allowed out. If you are content with slower drying, then ware will eventually dry enough in a simple humidity chamber so that all shrinkage has occurred (final drying will need to be in a slowly fired kiln or out in the open). For a continuous process, a tunnel accessible at both ends is best, with carts that push in one end and come out the other. The full heat of the furnace should blow near the exit of the tunnel where outside dry air is also introduced. The flow of air should proceed toward the entrance where the lowest heat and maximum humidity are present. Vents along the tunnel can be used to introduce outside fresh air or expel humid air, as needed (to fine-tune the process). Drying difficulty increases exponentially with ware size and weight. So do not underestimate the escalation of problems in drying ware that is larger than what has been made in the past. For example, while 10 inch plates may have presented few problems for years, going to the production of 12 inch ones could multiply drying loses tenfold. Some shapes of widely varying thickness and angular contours are particularly difficult. Large plates, especially porcelain ones, can be a real challenge. Many companies are very mindful of the influence of shape and contour on the incidence of drying cracks and they take this into account when tooling up for production. Don't underestimate the effects of weather changes on drying patterns. Long cold damp periods that culminate in a dry spell can have a profound effect on drying, especially if the conditions have encouraged you or your workers to get sloppy. Cold winter months also often mean low humidity. Adjust your methods or make the drying environment as independent of these changes as possible, or adapt. Clay is composed of microscopic flat crystals. When they are randomly oriented in the plastic state, shrinkage is the same in all directions and no stress occurs during uniform drying. However, when they align, shrinkage is less along their length than width and cracking could thus occur even if drying is even. Particle orientation across the bottoms of wide thrown pieces, for example, tends to be more random than up the walls. So if you are hand throwing such ware, compress the bottom to try to line them up parallel to the surface to reduce stress during drying. Consider also how your forming equipment might be aligning particles in an uneven way. 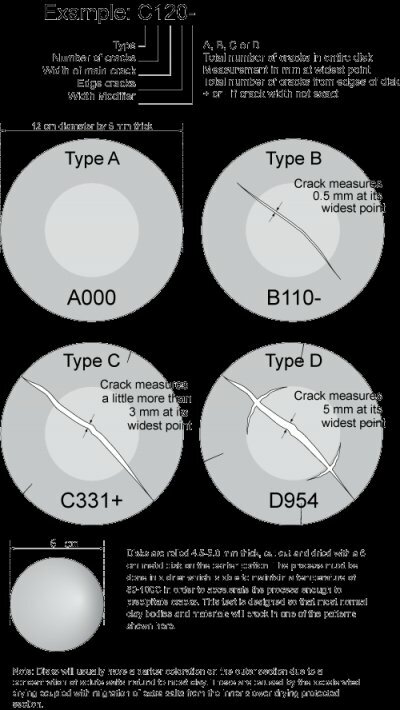 It is possible that the cause of cracking can be traced to a body that is too sensitive to material changes, or a drastic material change has affected a normally stable body. You may need to respond to such changes with a recipe adjustment. Never view the clay recipe as somehow sacred, shying away from adjustments to simple characteristics like shrinkage, permeability, and plasticity to maintain properties important for drying. On the other hand, don't be too quick to blame the body either. If a sanitary ware manufacturer can dry a 50 pound porcelain toilet and you are having trouble with a 2 pound stoneware plate, there is a good chance your process could be adjusted to solve the problem. If your body contains bentonite, for example, you could safely reduce it by 1 or 2 percent without having any impact on fired properties. This will increase permeability (so water can escape faster) and it will reduce shrinkage. Another approach would be to exchange some of the ball clay for a less plastic type of ball clay (or kaolin for a less plastic kaolin). This will have an effect similar to reducing the bentonite. A more extreme change (but still potentially safe) would be to replace some of the ball clay for normally much less plastic kaolin. Be aware of course, that a body of lower plasticity won't form quite as well, however you might find it easier to adapt to a plasticity loss than deal with drying cracks. Watch for any changes in body maturity and adjust with a slight drop or increase in feldspar if needed. 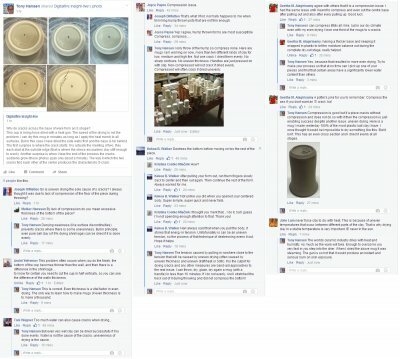 One more point: don't trust other peoples opinions about which kaolins and ball clays are more and less plastic, do drying shrinkage tests yourself to confirm. A very important aspect of optimizing your drying is having an effective way to test the drying performance of a clay. What is needed is a test that produces real numbers you can write down; a test that is sensitive to changes in a clay body's drying characteristics. Some labs have complex instruments and generate tons of numbers and reports but if you ask them to talk about a clay materials drying performance they are sometimes at a loss for words. Knowing particle surface area, particle size, shrinkage, etc. are all fine, but drying performance is a complex dynamic that also involves particle shape, identity and the nature of particle-particle and particle-water interactions. We need a simple test that displays before us drying performance. There is a predefined test named DFAC (or Drying Factor) that you can use in your account at insight-live.com. It enables you to specify real numbers that represent this property. 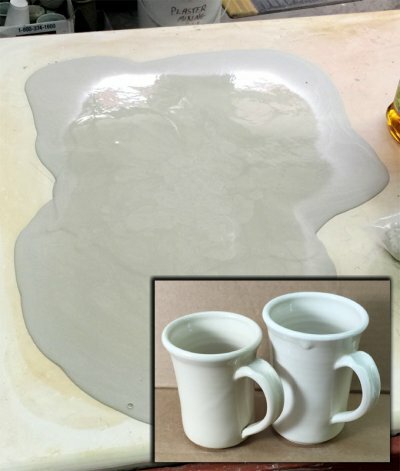 Do not expect a porcelain to dry as well as a stoneware or earthenware. Do not expect to be able to make any kind of shape and size using a porcelainous body, you need to be realistic. If ware has drastically differing thicknesses along its cross section and has angular contours then it will not be practical to make using certain bodies. At a minimum you need to be willing to do things differently than you have done. 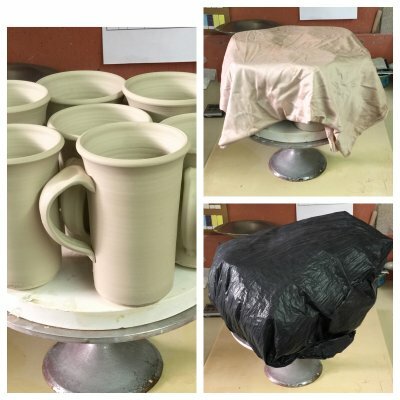 While industry cannot afford to have time or labor-consuming drying scenarios, individual potters can nurse finicky clay bodies through the drying and have driers that run much hotter. For example, porcelains can lose water very quickly (and therefore shrink a lot) during early minutes and hours of drying. It might be possible to successfully dry otherwise troublesome pieces by covering them almost immediately after forming and leaving them as much as a few days to slowly descend through initial drying. Actually, in industry humidity drying chambers can be set to any needed schedule so this same approach might be needed for some circumstances. The DFAC test is valuable because it does not require any specialized equipment (other than a drying cabinet that can maintain 80-100°C). 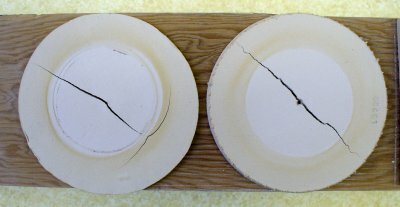 Care is required to prepare the disk from well-wedged clay (using the same movements and water content each time and not handling or bending the disk more than absolutely necessary, the relevance of this test depends heavily on your ability to maintain a consistent method of disk preparation). Don't live in the past, control the drying process now. It is true, maybe it did work before. We must respond to 'now' and be open to the possibility that past success was luck, a position on the edge of a precipice from which you have now fallen. Thus a 5% cracking loss today on ware that all receives the same drying treatment could mean 50% tomorrow (depending on how precarious your process is). Take cracked ware seriously, even a few pieces can betray a flawed process and it could be just luck that has spared the rest. Pretest your clay so you know exactly where you stand. The drying process is not really a black art. Just work toward the goal of being able to pick up a piece of ware at any stage of drying with confidence that water content tests taken anywhere on the piece will yield similar results. Yes, it is fine to keep making all those mistakes and learning what does not work. But at the same time, don't forget the things that do work! Insight-live.com defines a related test it abbreviates 'SOLU'. This test deals with the measurement of the incidence of soluble salts in clay bodies and materials. This test employs the specimens made for the DFAC test. You can find information elsewhere here on the theory of what soluble salts are (see article on use of barium carbonate in clay bodies), their potentially detrimental effects and how this test can be performed with simple equipment. Soluble salt surface depositing (or efflorescence) is a phenomenon not understood my many ceramists but one that will one day make itself known to you if it has not already done so. It is something that can affect any type of clay body, from porcelain to brick clay (the brick industry knows all about it!). The photo shown here displays some ball clay drying disk fragments. Notice the dramatic effect on surface coloration these salts can have. As noted, barium carbonate is commonly used to precipitate salts so they do not migrate to the surface with the water during drying. Drying disks used for the DFAC test are 12cm in diameter and 5mm thick (wet). 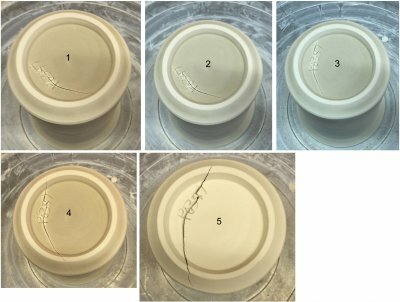 A crack pattern develops in almost all common pottery clays as they shrink during drying. This happens because the center portion is covered and stays soft while the perimeter dries hard. This sets up a tug-of-war with the later-drying inner section pulling at the outer rigid perimeter and forcing a crack (starting from the center). If the clay has high plasticity and dry strength it can pull so hard from the center that cracks appear at the outer dried edge to relieve the tension. Or, it can create cracks that run parallel to the outer edge but at the boundary between the inner and outer sections. The nature, number and width of the cracks are interpreted to produce a drying factor that can be recorded. Handles expose all sides to the air and dry (and therefore shrink) much more quickly than the walls. Anything you can do to slow them down will produce a more even drying process. 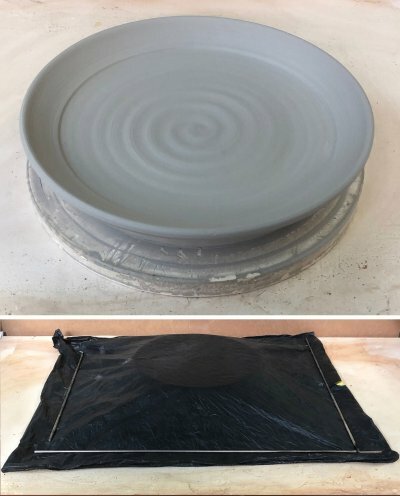 Wanna throw porcelain plates with thick bottoms and thin rims? Then they may need a week to dry! This plate had a one-inch-thick base (while the rim is a quarter of that). During the first few hours a thin rim like this will dry quickly, leaving the base far behind. But as soon as it would support the weight of a cover-cloth I put it into a garbage bag and sealed and left it for several days. Even after that it did not detach easily, even though the bat had been dry. The base was still quite soft but the rim was stiff enough to enable turning it over and trimming it (I endeavoured to create a cross section of even thickness). Then I dried it under layers of cloth for several more days. It took at least a week. Had I allowed the rim to dry out during the first few hours it would likely have cracked later on. At first I was wondering why those two mugs cracked so badly. But actually, I should be wondering why that one did not crack! This clay has 8% drying shrinkage and is very plastic, it should crack when it dries. But still, the uncracked one demonstrates with the extra care I could probably have dried all three successfully. Suppose you use a plastic porcelain and throw large, flat pieces. They should actually crack. If they do not, expect them to do so if you do not take great care in drying them. What is great care? At no time in the drying process should any part of the piece be stiffer than another. Sometimes throwing on a plaster bat is the only way to make this happen. Do grog additions always produce better drying performance? This DFAC test for drying performance compares a typical white stoneware body (left) and the same body with 10% added 50-80 mesh molochite grog. The character of the crack changes somewhat, but otherwise there appears to be no improvement. While the grog addition reduces drying shrinkage by 0.5-0.75% it also cuts dry strength (as a result, the crack is jagged, not a clean line). The grog vents water to the surface better, notice the soluble salts do not concentrate as much. Another issue is the jagged edges of the disk, it is more difficult to cut a clean line in the plastic clay. 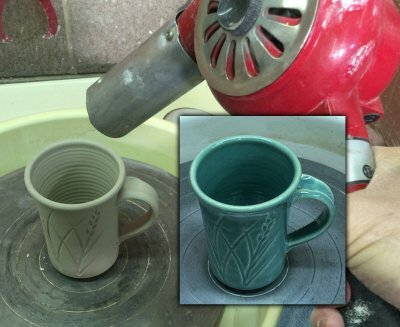 Can you dry a mug with handle in two hours? Yes. The lid of my firing kiln seems to be just the right environment for even drying, even of freshly thrown pieces. By the time this mug really got under way here the kiln was at 1000F and the lid was getting pretty hot. The bottom was the warmest and the top coolest, the exact opposite of how drying normally becomes uneven (the top drying first). This principle could be employed to make a heated drying chamber. The interior space could be kept at high humidity and a draft of air through it could remove humid air and the needed rate. 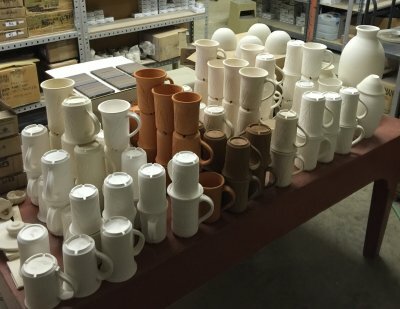 After rotating in front of a fan these porcelain mugs were ready for trimming and handle attachment in 15 minutes. Then they were turned over, the handles wrapped and in another 45 minutes were dry and ready to fire. It is not how fast you dry something, it is how even. The handles would normally dry faster so this retards them enough to stay in sync with the rest of the cup. Compression of the base is the key to avoiding S-cracks? Wrong. This is an exchange I had on Facebook on this topic. Many people believe cracks are caused by high water content, high shrinkage clay, not compressing the base when throwing, throwing off the hump or stretching the clay excessively when throwing. But I break some or all of these rules every time I make mugs and have almost no cracks. Why? Because the reason pieces crack is unevenness in wall thickness and drying. And I make sure both are even. Why were these handles pulled an hour after the mugs were thrown? Because they dry and stiffen much faster. When the handles are glued on with slip about an hour later they are about the same stiffness as the mugs. 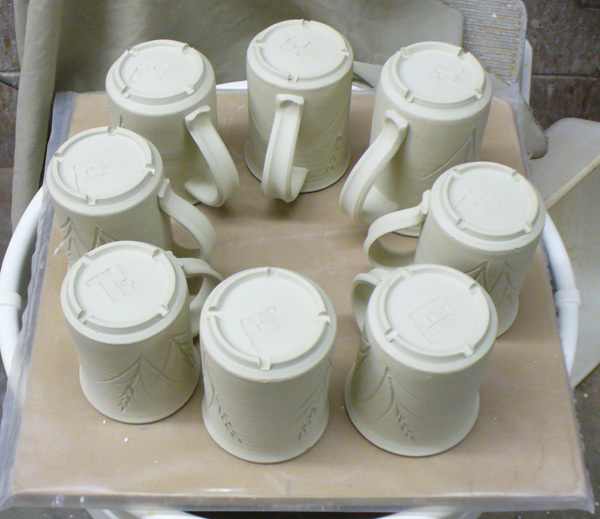 The handled mugs, which are sitting on plaster batts, will then be covered with cloth and plastic over night. The next morning, the bases will have stiffened and all sections of the mugs will be about the same stiffness, ready for trimming. After that they will be decorated, then placed on smooth wooden batts and wrapped with a cloth for drying. 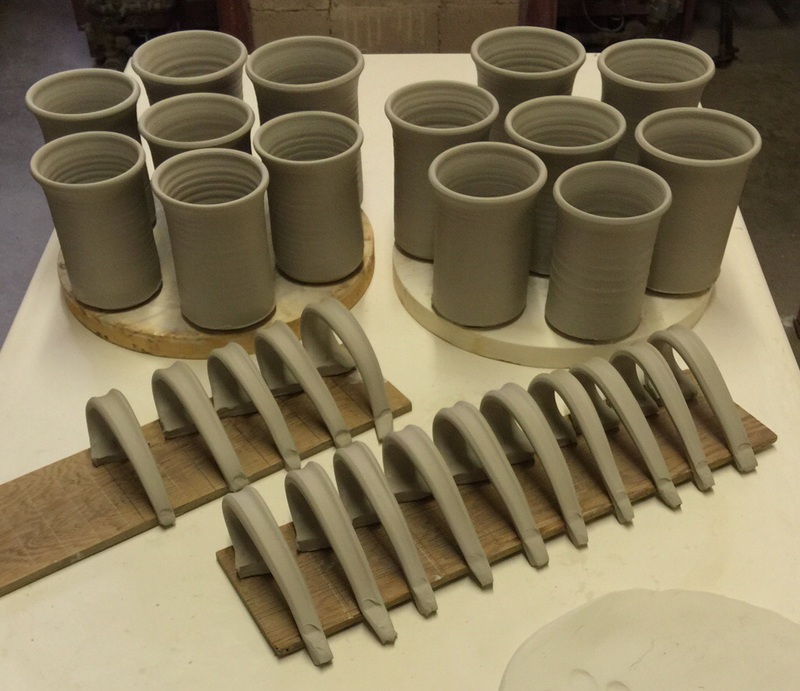 In industry fast drying and firing are standard, but potters still dry for days and firing cycles are often 24 hours. But it is surprising how much even very plastic clay can be pushed. This porcelain slurry dewatered to plastic in 30 minutes. 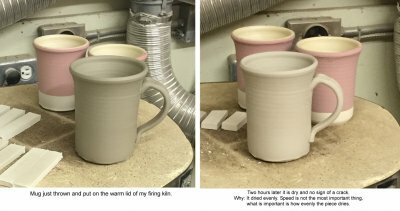 I threw the mugs and attached handles after 15 minutes fan-drying, then put them into a 240F test kiln immediately (with exhaust fan going). This created a high humidity hot zone that dried them quickly and evenly (trimmable in 15 minutes, ready to green-glaze inside in 30, glaze outside 15 more). Then I fired them to 1-hour-soak at 240F and go full speed to cone 6, soak 10 minutes and shut off. I ice-watered them when they hit 300F on cool-down (IWCT test). I did get a bubble on the outside of one and a weird surface crack traveling about 5 mm below the rim on the other, so a few minutes extra glaze drying time was needed before firing. Half of these Plainsman Polar Ice mugs cracked. But I know exactly why it happened! After throwing them I put them on a slowly rotating wheelhead in front of a fan to stiffen them enough so I could attach the handles quickly. Of course, I forgot them and they got quite stiff on the lip (while the bottom was still wet). I quickly attached the handles and then covered them with cloth and plastic and let them sit for two days to let them even out. Notwithstanding that, that early gradient sealed their destiny. The lesson: At no time in the drying process should any part of a piece be significantly ahead of another part. It is important that during all stages of drying gradients (sections of different stiffnesses) do not develop in pieces. Thus I like to attach handles as soon after throwing as possible. An unavoidable gradient develops anyway because the rims need to be stiff enough to attach the handles without going out of shape too much. Now how can I stiffen these mugs for trimming and even them out at the same time? The first key is to put them on a plaster bat (as I have done here). Then I cover them with a fabric (arnel fabric works well because it flows). Then I put the whole thing into a large garbage plastic bag folded underneath to seal it. The plaster stiffens the bases and absorbs moisture in the air to stiffen the walls also. The next day every part of the piece is an even leather hard. 18 hours from thrown on the wheel to glazed and out of the kiln! It took 2-3 minutes to get this mug to soft leather hard for trimming using a heat-gun (not a blow drier). It took seconds to stiffen the handle for attachment after. I am now taking it to stiff leather hard to prepare for glazing (left). I dry it evenly by judicious technique. Then I pour-glaze the inside and immediately push it lip-down down into the glaze to do the outside. I re-gun it a couple of minutes and then re-dip the outside bottom (up to the previous glaze boundary). Last I gun it another 3 minutes an put it in the kiln. The lesson: The key is not drying speed. It is how even the drying is (I watch the color change and focus on the wettest parts). Finally I fire 400F/hr to cone 6 (with an hour soak at 250F for final water smoking). The clay: Plainsman M370. Why do cracks across the base of ware form an S shape? This cup is being force dried with a heat gun. The speed of the drying is not the problem. I can dry this mug in minutes as long as I apply the heat evenly to all surfaces. But in this case I have dried the side walls first and the base is far behind. The first surprise is where the crack starts: It is actually the meeting of two, they each start at the outside edge (that is where the stress encounters clay stiff enough to crack). Another surprise is when: Near the end of the process the cracks suddenly grow (these photos span only about a minute). The way it which the two cracks find each other at the center produces the characteristic S-crack. Sixteen kinds of clay. No mugs have cracked in drying. Why? The key is avoidance of methods that result in one part of the piece being stiffer at any stage of drying (not vinegar in the water, compressing the bottoms, etc.). Throw mugs with walls of even thickness. Put them on a plaster bat (it dewaters the base). 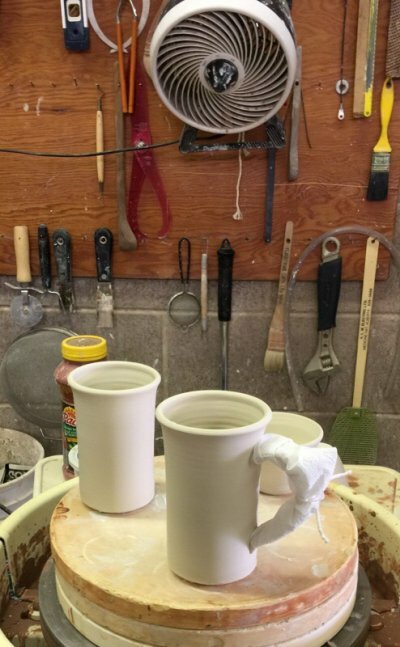 Make the handles a while after you have made the mugs (they stiffen quicker). Apply them as soon as the rims are stiff enough to maintain shape (in my climate, two hours). Use a join method that enables application of lots of pressure (better than scoring). Use only enough slip (of thick cream consistency) to make the join (no excessive squirting out at the perimeter). Pack all the mugs closely on bats, rims up, cover with flowing cloth (e.g. arnel). Put them inside big bags or wrap plastic around and tuck it under. Trim the bases the next day (to the same thickness as the walls). Place rims down (with handles at the center) on smooth batts (not plaster) and cover them with large fabrics that can wrap under leaving no holes exposed to the outside air (in our dry climate two days dries them). The center portion was protected while the perimeter dried and shrank first (reshaping the central section). No cracks. But as the central area hardened it reached a point where it was stiff enough to impose forces that forced two cracks to start from the outer edge (opposite each other), these grew inward and found each other. Then the gap widened to dissipate more of the stresses (the width of this gap relates to the drying shrinkage of the clay). 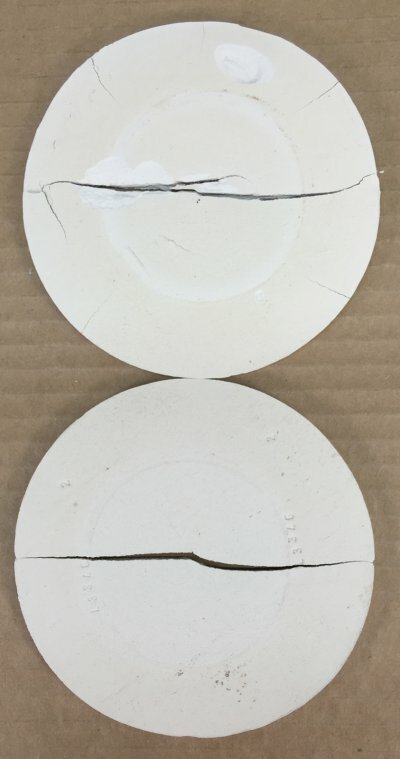 But the accelerated pace in the top disk left more stresses, they were relieved by the other hairline cracks from the outer edge, these happened at the very end.The lesson: The stage was set for cracking on both samples very early in the drying process. But the actual cracks occurred very late. Accelerating the process only created small extra edge cracks (on top disk). Drying mugs in front of a fan in 2 hours. No Cracks. These are Plainsman Coffee clay. They, and the handles, were made on the wheel about half an hour ago, then stiffened enough in front of the fan to enable handle attachment. Coffee clay is plastic and will crack if pieces are not dried evenly. But if they are dried evenly, there is no problem. The handles were waxed after they were attached (leaving only a thin section on the inside where some water could escape). This slowed them down, otherwise they would have dried far ahead of the body. They went in the kiln and were ready for glazing the next morning.